I was all set to write about this puzzle last Sunday when I got rudely interrupted by Derek and Steve's HELLical Burr. So I set this aside and have got to it now. Yet again my apologies - this may be shorter or lower quality than my usual writing as I am producing this from my sickbed - I have a cold and it seems to be bad enough to rename it "MANBOLA"! I seldom get ill but when I get a cold it always seems to knock me sideways! The Cast U&U was designed by Kyoo Wong from Hong Kong, who also designed the very ingenious Cast Delta and, like his first puzzle, the U&U is a very new mechanism/idea. It was released in April 2014 and seemed to take quite a long time to reach the West. I did get to play with a prototype at a Midlands Puzzle Party which Wil was letting people play with. I only tried for a few minutes before getting sidetracked by other toys/people and on that one, found that one of the nuts would unscrew off one end. That was as far as I got. The usual puzzle provider sold out very quickly and even Puzzle Master did not have any for ages. So I was left to reading other reviews by Jerry and Gabriel and drooling over yet another shiny toy for a while before I could get a hold of one for myself. I finally managed to get my grimy mitts on one in my last delivery from Puzzle Master and am quite pleased that I did. It arrived in the usual immaculate black Hanayama packaging and, as intended, looks pleasantly industrial! 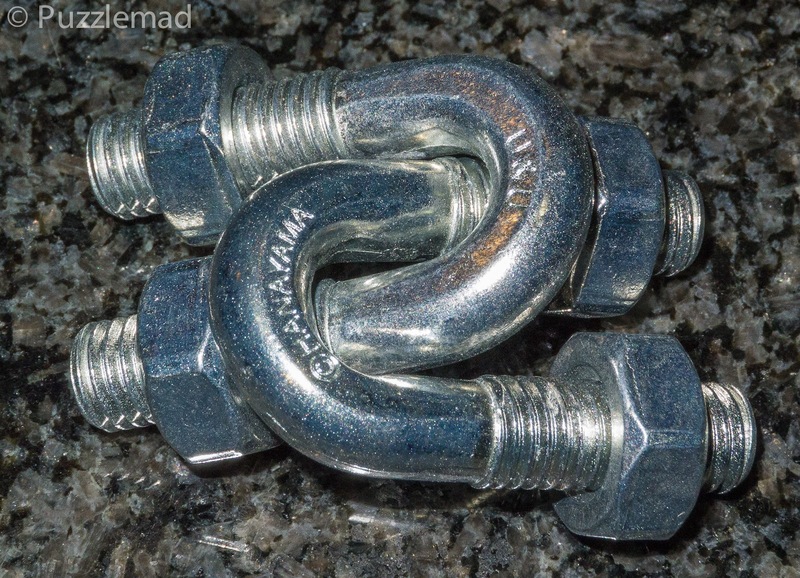 It consists of 2 double ended bolts with nuts on each end which have been intertwined. From the look of it, it could easily have been made from parts bought from a hardware store. The instructions on the box are simply to separate the 2 bolts and then put them back how you found them. 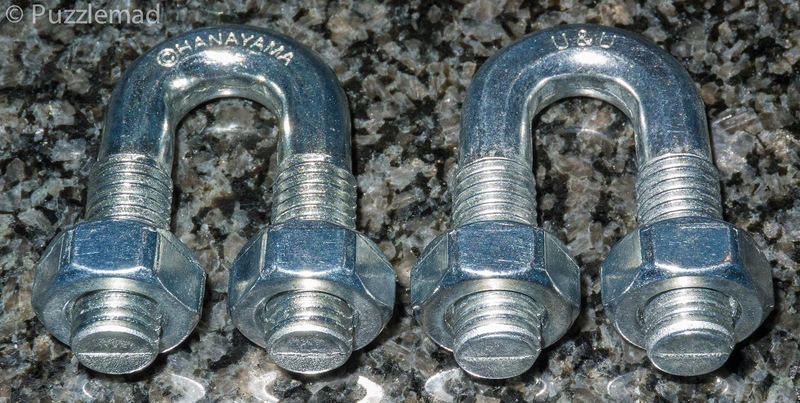 Hanayama rate this as level 4/6 and Puzzle Master as 8 (Demanding) on their scale of 5-10. I think they got the difficulty level just about right - it will not take a seasoned puzzler too long to solve but a beginner might struggle for quite some time. As usual, there is no solution included but it can be downloaded from Puzzle Master here. Remembering how I had removed a nut from one end at that MPP, I immediately attempted to do that again...... and failed! It would appear that the prototype that Wil had was not made accurately enough and the final version was made such that none of the nuts could unscrew. So back to the drawing board on it. Now I am not bad at disentanglement puzzles having done so many of them and I quickly went and tried a few of the standard techniques...... and failed! Hmmm! At this point it was time to actually look hard at the construction and think©. My that was painful! After a little while studying the puzzle there are some features (more than one) that you can see which might be important. Let's face it, if there's anything special that you notice with these then it's always there for a reason, so use it. The question is how? Its a U & another U! Now put it back! I did find this particular puzzle a little unsatisfactory because my Aha! moment did not lead to an immediate solution. The Aha! moment was quite nice to find (twice) but the fact that afterwards you still had to crawl to the solution was a little unsatisfactory for me. However, despite that, I am very pleased to have it in my collection and have played with it a fair bit since my first solve. Putting it back together is simply the reverse of taking it apart but I did find it quite awkward because the 2 halves do not appear to be identical and if you don't realise that from the start and pick up the wrong piece first then it will be impossible. Overall, this is a nicely puzzle and very well engineered. It is a decent challenge for a non-newbie but probably not good for a beginner as it requires too many small exact movements and I worry that the threads could get damaged if someone was to attempt to use any force. For $13 however, you can't go wrong and you all know that it is important to own the entire Hanayama collection even if it would cost $610 all in one go!